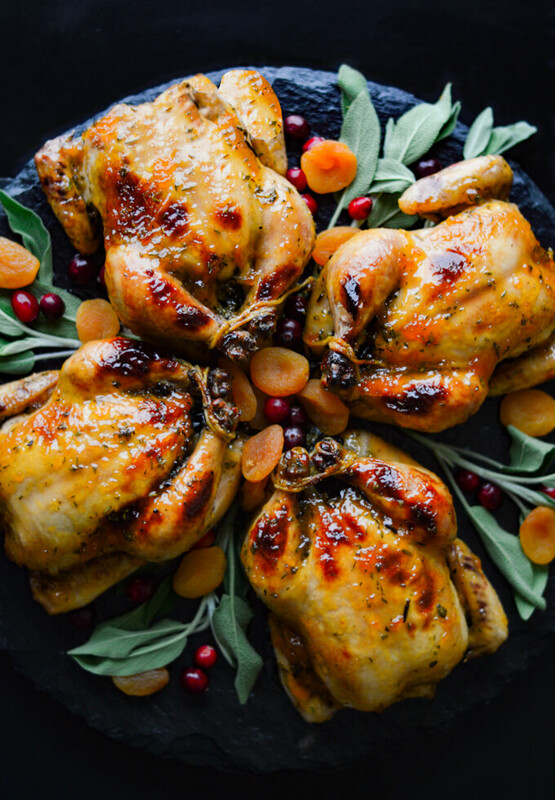 These stuffed Cornish Hens will be a stunning display of beauty on any table where they find themselves. 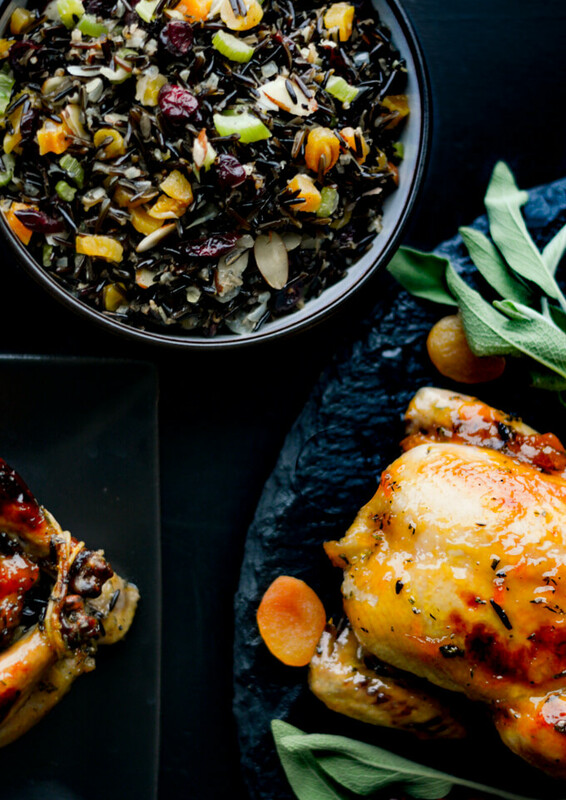 Shimmering with an apricot glaze and packed with wild rice stuffing that’s loaded with dried apricots and cranberries. This dish is sure to be a “show stopper” for any get-together or dinner party you throw. 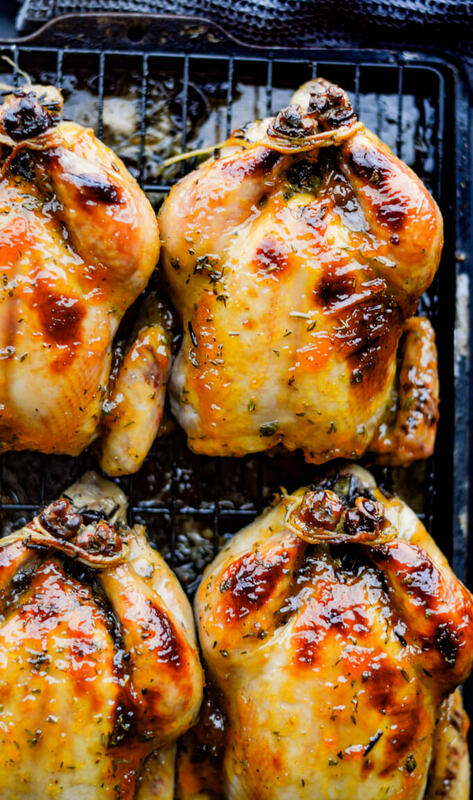 You might be saying to yourself, “What’s so exciting about Cornish hens? They’re just little chickens.” True, but so much more! They have a “fancy air” to the extent which finds their way to elegant dinner parties or ritzy restaurants. These beauties are the perfect recommendation for your Christmas dinner coming up in a few weeks. It will automatically bring a “wow” effect to your holiday table. These little birds are perfect for individual servings. 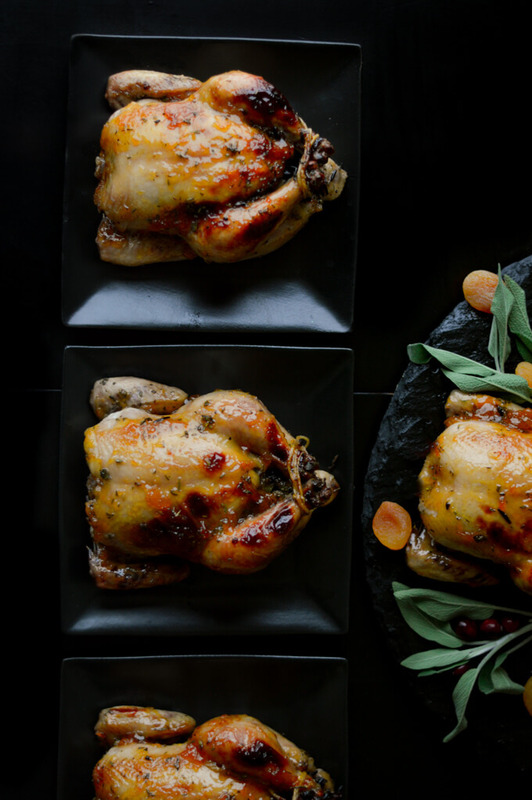 Each Cornish hen is a generous single portion and a treat when you give a guest their own entree prepared individually for them. These birds have a luxurious feel about them but are very practical without the fuss and hassle of a large turkey. Cornish Hens sit so beautifully on a serving tray. This is such an impressive presentation in the middle of your table. The glaze with produces an orange hue is gorgeous on the skin of these hens. Garnishing the tray with fresh sage, dried apricots, and fresh cranberries will create a festive feel for your guests during the Holiday season. The wild rice stuffing adds both texture and depth of flavor to this dish. The wild rice is combined with chopped celery, onion and garlic along with dried apricots and craisins. This is the perfect combination that enhances the overall flavor of this featured entree. One of the things that I would recommend for the wild rice stuffing is to make sure the rice is cooked until the grain has burst open a bit and it’s tender and fluffy. Unlike regular rice, wild rice does not absorb all the water, therefore, you will need to drain the excess liquid from the rice. After you sauté the celery, onions and garlic, combine it with the rice and raisins, chopped dried apricots and almonds. 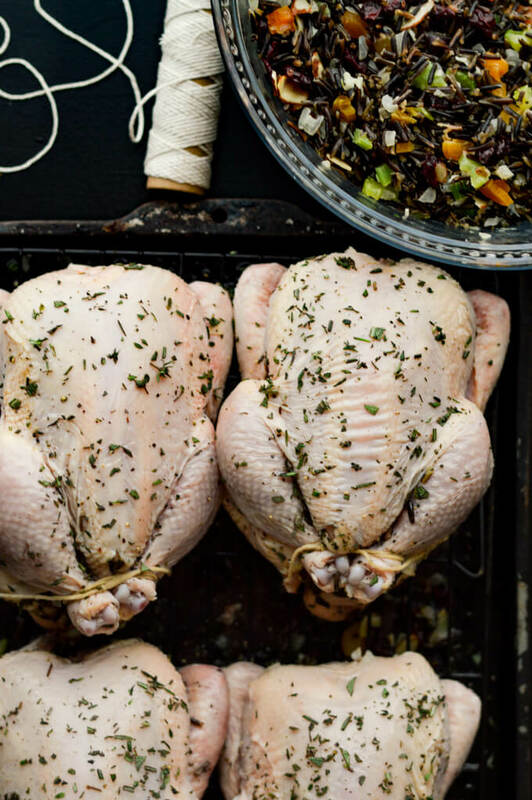 Remove the giblets from the Cornish hens and rinse the hens both inside and out. Dry them with a paper towel and generously salt and pepper the insides of the hens. Shake out any excess seasonings. Pack with the wild rice stuffing. Using kitchen string tie the legs together. Rub olive oil on all sides of the Cornish hens and generously salt and pepper the outside of the birds. Lay breast side up in a shallow roasting pan and tuck under the wings. Sprinkle with fresh herbs. The apricot preserves mixed with triple sec is what gives these little birds their gorgeous orange hue. Baste them before they go in the oven and continue basting every 20 minutes while they are roasting. Preheat the oven to 400°F and cook uncovered for about 80 minutes or until an instant-read thermometer registers 165°F in the thigh. If they start to burn while cooking, tent foil over them but remove the foil for the last 15 minutes of cooking. There should’ve been more than enough rice to stuff each hen with plenty left over for a side dish. Cover the extra wild rice stuffing and throw it in the oven for the last 15-20 minutes while cooking the cornish hens to ensure the stuffing is nice and warm. Remove the hens from the oven and tent with more foil and let them sit for 10 minutes. You have a couple options when serving these adorable little birds. You can place a single Cornish hen on a plate which is then displayed at each guest’s place setting. Or you can display them on a serving tray and garnish with fresh sage, dried apricots, and fresh cranberries as a festive centerpiece for your Holiday table. 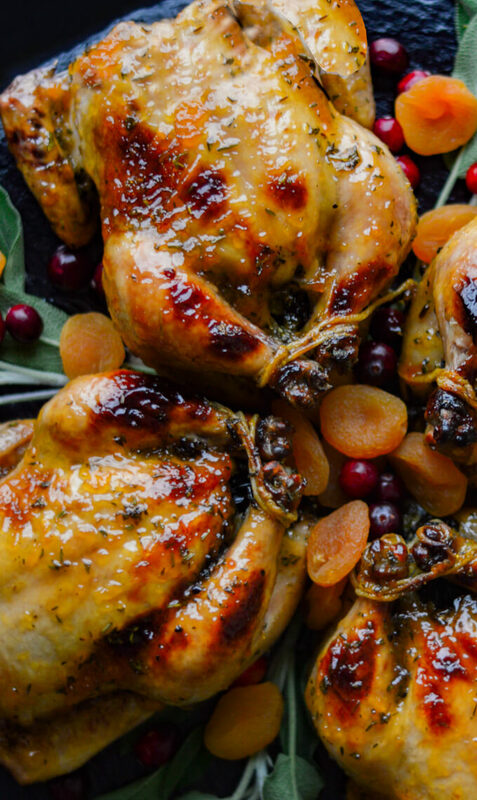 If you’re tired of the traditional ham or turkey for the Holidays, give these gorgeous Cornish hens a go. 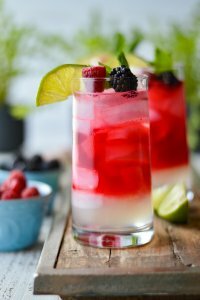 You can make as many as you need for either a small gathering or a large one. I think you just might find that they’re your new go-to holiday entree. This dish is the perfect alternative to your Holiday turkey. Each guest has their own individual bird. 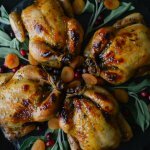 The apricot glaze adds a nice dimension of flavor along with the wild rice stuffing which has dried apricots and cranberries. Melt butter in a large skillet, sauté onions and celery over medium heat until they are soft, approximately 10 minutes. Add salt and pepper as they cook. Add garlic and cook for one more minute. Combine wild rice, apricots, cranberries, almonds, and veggies in a medium-size bowl. Set aside. Preheat the oven to 400° F. Rinse Cornish hens inside and out and dry with paper towels. 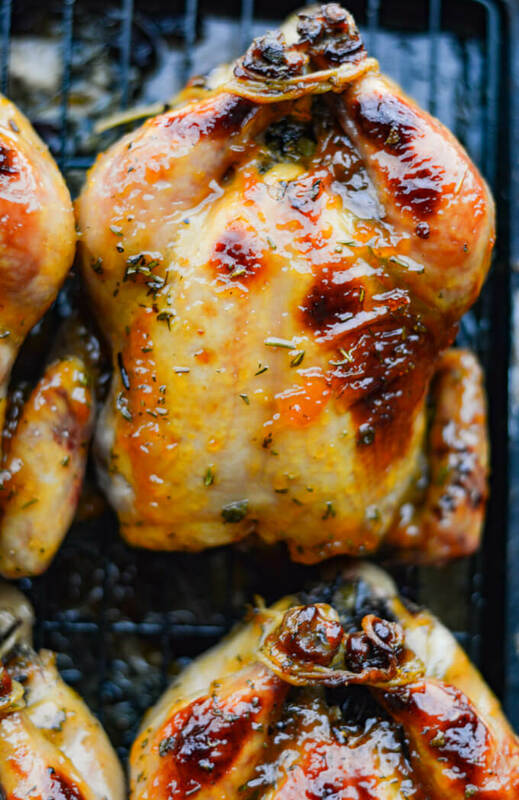 Rub the olive oil on all sides of the hens. Generously salt and pepper both inside and out. Rub the herbs on the hens. Fill each cavity with 1/2 cup of the wild rice stuffing. Tie the legs of each bird together and tuck the wings under. Place breast side up on a rack in a shallow pan. 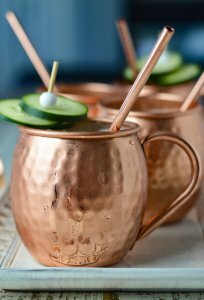 Mix together the apricot preserves and triple sec. Baste each bird and cook for 80-90 minutes or until an instant-read thermometer registers 165° F in the thigh. While the birds are cooking, continue to baste every 15-20 minutes with the apricot glaze. If they start to burn, tent foil over them. Remove the foil for the last 15 minutes of cooking. At this time place the remaining stuffing in an ovenproof pan and place in the oven to warm. Remove from the oven and tent more foil over the top and let them sit for 10 minutes. Serve with the remaining wild rice stuffing. Cornish hens are the best when cooking for small get together and everyone has their own portion. What a great idea. Love the photos also. Thanks so much Freddie! You are always so encouraging. I love everything about this meal! 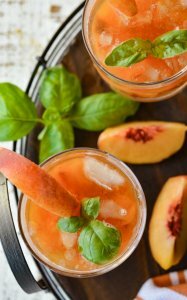 Apricots and dried apricots are fabulous, especially mixed with poultry and cranberries. Gorgeous photos!!! Thanks so much Mimi! I do love this alternative to a turkey. It has such a nice presentation to individual guests. This blog was born from a conviction that food isn’t just about eating, but about inspiring and cultivating relationships. I hope it encourages you to slow down and live life to the fullest with family and friends around your table.